Survey the capital’s ancient temples to reveal its prominent role in the history of the Thai Kingdom. Meander down the beckoning alleyways for Bangkok’s favorite street eats. And observe the city’s modernity by shopping in their multi-story luxury megamalls. A place where centuries old golden stupas share the skyline with futuristic skyscrapers, there is no other city that presents such a stark contrast. Exotic Bangkok is a sanctuary for history buffs, fervent shoppers and ardent food lovers. No matter what your interests may be, a Bangkok honeymoon can satisfy any couple. Though hot year round, Bangkok’s dry and coolest season spans from November to February. December is the peak travel month with soaring prices. The tropical monsoon season from July to October sees rainstorms, while March through June remains hot and humid. Chatuchak Weekend Market: Also recognized as JJ Market, Chatuchak carries the title of world’s largest weekend market. Impressive for its sheer size, this market is a labyrinth of thousands of enticing stalls, offering an array of clothing, antiques, pets and everything in between. Authentic Pad Thai: Take to the streets when it comes to this beloved noodle dish, as street vendors perfectly balances the flavours of spicy and sweet. Assembled fresh before your eyes, devour the meal while it’s hot on the sidewalk’s plastic table and chairs for an authentic experience. Chao Phraya River Tour: Hire a boat and explore the banks of the Chao Phraya River. Bordered by historical gems of striking architecture, this river is also home to one of Bangkok’s few remaining enclaves of traditional wooden homes on stilts. Wat Arun: Translated as “Temple of the Dawn,” its distinctive spire towers over the Chao Phraya, and is observed for its stunning multicolored porcelain facades. Grand Palace: Undoubtedly one of Bangkok’s top visited sites, the Grand Palace was the powerful residence and seat of royalty for almost two centuries beginning in the 1700s. Sky Bar at Lebua: Famously recognized as a filming location for one of Hollywood’s favourite movies, Hangover 2, this 63rd story cocktail bar promotes an impeccable panoramic view of Bangkok, and holds a strict smart casual dress code policy. Muay Thai: Immerse yourselves in Thai heritage by observing a riveting match of this highly respected national combat sport that fighters have dedicated years of mental and physical discipline to master. Take a Tuk Tuk: An icon of Bangkok, these three wheeled auto rickshaws are an accessible and entertaining way of navigating short routes through the city. Sukhumvit Soi 11: A visit to the string of kitschy bars and trendy nightclubs of Soi 11 guarantees an unforgettable night of after-hours fun, as this is an expat favorite for Bangkok’s pulsing nightlife. Thai Massage: Learn to relax your body as you indulge in a traditional Thai massage and absorb the zen of your surroundings. 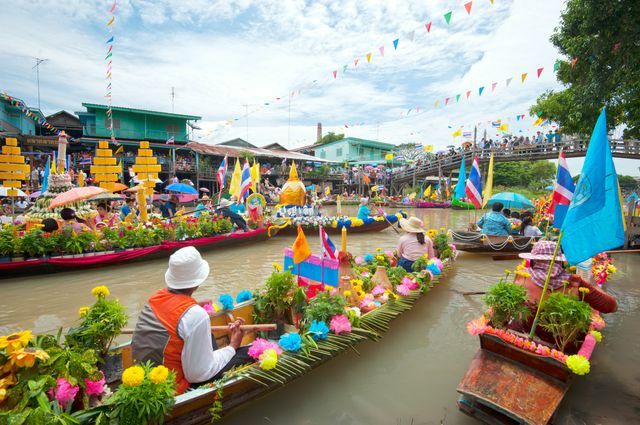 Amphawa Floating Market: An hour and a half from the heart of Bangkok lies an authentic floating market, where long-tail boats entice its shoppers with colorful arrangements of exotic fruits and the aromatic smells of fresh seafood waft through the air. Wat Pho: A sacred space and Bangkok’s place of worship for Buddhists, this temple houses the golden reclining Buddha that stretches 46 meters in length.